PanARMENIAN.Net - Editor Shahin Hajiyev from the Azerbaijan’s Turan Information Agency has arrived in Armenia, Foreign Ministry spokeswoman Anna Naghdalyan told reporters on Tuesday, February 5. Adviser to the Armenian President Tevan Poghosyan too weighed in on Hajiyev’s visit to Yerevan. 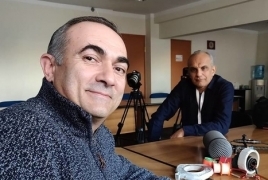 He posted a picture with the Azerbaijani journalist on social media and revealed having given an interview earlier in the day. No stories have been published on the agency’s website yet.